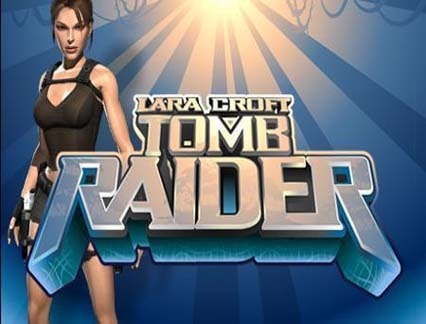 Game Information: If you are an ardent video gamer, you will be acquainted with the character of Lara Croft; the stylish female English treasure hunter who first hit the computer screens in 1996. The most recent game release was in 2013 and the heroine still appeared in movies. She is the female version of Indiana Jones-crafty, fearless and attractive. This game version if the Tomb Raider is from Microgaming. The game features 15 pay-lines and 5 reels allowing you with multiple ways to win. The game has an RTP of 96.56% which is below the average for the market and lowers the chances of winning big money. The game takes some bit of its main character features with amazing graphics and fun features including a pick and win game, and free spins. Unlike its successor, Secrets of the Sword, Tomb Raider is a modest game with restricted bonus potential. Nonetheless, the bonuses offered in the game are not as tricky as those found in other games and are somewhat decent for players from time to time. Lara Croft dominates the reels in various action poses. Other symbols include idols, tigers and the card symbols. 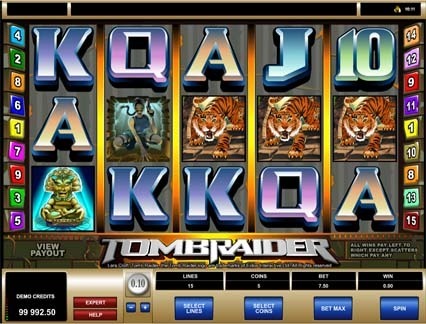 The Tomb Raider Logo is the wild and substitutes all symbols except the scatter and doubles the winnings. Lara Croft: The Lara Croft symbol is the game’s scatter symbol. By landing 3 or more of the scatters on the reels triggers 10 free spins. Even better is the fact that these free spins come with a 3x multiplier and can be retriggered at any point in the free round by simply aligning 3 or more scatters. The free spins regularly retrigger making it a great way to start winning some decent amounts. Idol: Three or more of the idol symbols trigger the main bonus feature. This is a bonus round where players select from the 12 idols accessible on the screen. Each idol has a prize with their value based on the number of bonus symbols activating the round from 3 to 5 respectively. The maximum amount you can win, if lucky, in this round is 2, 500 x your initial wage. The minimum amount is 36x your original bet. Tomb Raider is a visually impressive online pokie game but the audio is not something that you will thrilled about. The visuals for both the main game and the bonus game evoke feelings of adventure. This is because they present scenes from past Tom Raider games and shows areas that can be visited. Considering the fact that the symbols are taken form past Tom Raider games means that they have some degree of reality that lends itself to the overall game theme. The music and sound adds to this by creating some tension within the game. It has a Las Vegas-style and does little to remind you much of the Tomb Raider series. However, it is a captivating game and you will surely love playing it. There is no progressive jackpot in the Tomb Rider- Lara Croft. Aligning up to 5 Lara Croft wild symbols wins you a maximum of 7500x on your wager; this is the biggest jackpot the game offers. This is not something that easily achieved but those who are lucky enough will be laughing all the way to the bank! The idols pay up to 2500x for a winning line which is a bit higher than what you would expect from lining up five of the regular pay symbols. Generally, the paytable is reasonably generous and just about enough to keep you interested in what you may win. While the game doesn’t have a progressive jackpot, there is both the multiplier and a mobile version to make things a bit spicy. 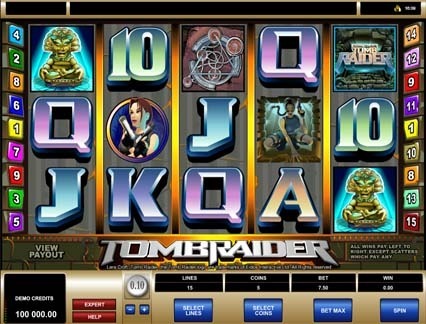 The biggest attraction in Tomb Raider is the free spins feature. When you land three or more of the Lara Scatters, you will be rewarded with 10 free spins. All the winnings during this round are subjected to a 3x multiplier and the best are played at the same level as one which triggered the bonus. Landing three or more scatters will win you more free spins indefinitely. The Idol bonus is another feature worth looking out for. The idol bonus game is a simple prompt win bonus game where players are offered a number of chances to choose idols and each statue gives them an instant win. By landing three symbols, you get three statues to choose, four symbols give you four statues and five allow you five idols. The maximum win that can be earned from the idol is 2, 500 coins.